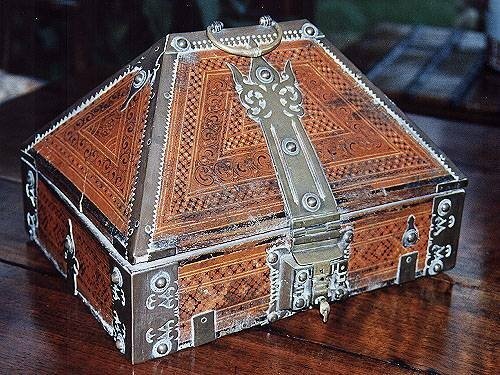 A 19th century Indian casket, brass bound and finely decorated with 'pen-work'. A superior example of the type. Size: 8 inches tall, 12 inches wide, 9 inches deep. Please note: a very similar casket was sold at Christie's South Kensington, Lot 100, Sale 8291, 19th February 2013, for £2000. An impressive Italian Baroque carved and giltwood candlestick in good unrestored condition. This handsome Qing Dynasty document box, from the Shanxi region of China, has an aesthetically outstanding form. The domed rectangular shape has almost architectural characteristics defined by its refinement of line, proportion and curvilinear shaping. This beautifully worn patination of the tightly stretched lacquered leather domed top has an elegant refinement. The vellum interior remains well preserved. After about 150 years of use inevitably there are some small damages to the leather top and one corner (both illustrated). The box remains completely unrestored in original state. The stitching and metal ware are pared to a decorative and functional minimum, to enhance the elegantly simple lines. 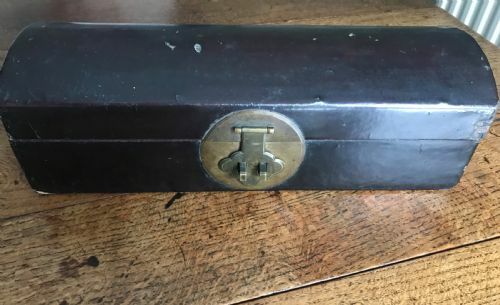 On the front is a cloud shaped lock with pin sets on a round metal plate. Functionality is an imperative in Chinese antiques: these boxes were practical and decorative pieces for storage of valuables and documents, and they are equally suited for this today, being displayed on desks, mantelpieces and tables. Their simplicity of shape and lustre of mellowed leather finish complements both Asian and Western interior design. The box also represents a good example of how lacquer finish was used to preserve and decorate accessories. Most Qing dynasty lacquered antiques were either red, which was made by adding cinnabar to the almost transparent lacquer, or black , made by the addition of iron oxide to lacquer. These type of boxes have their origins with the pillow boxes: unlike the West hard pillows were used...over time Chinese pillows have been made of wood, jade porcelain, bamboo and lacquered-leather, and were originally concave or dome shaped. This shape both cradled the neck and protected the elaborate arrangements of hair in both men and women of high rank. As an added benefit they could contain small valuables while their owner slept, providing an element of peace of mind regarding security. SIZE: 16.5 wide x 5 tall x 5.5 inches deep. PROVENANCE: From a deceased Hampshire collection, brought from China by the collector in person about 18 years ago. 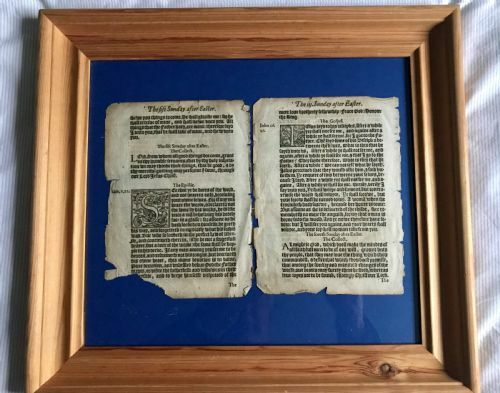 Mounted and framed, these two pages, from a 1662 Book of Common Prayer, gothic blackletter and illustrated chapter letters, are a very decorative item. They were discovered behind an 18th century painting. SIZE: 14 x 15.5 inches framed.